← How to set the bit depth while converting html to bmp? Have you ever met this problem that the pages are shown by a very large size or a very small size.Many office workers said that it is very common for them to meet this problem and when they meet this problem and find that it is difficult for them to adjust the size.Here is a good news that the company verypdf.com Inc are experts for this kind of problems.Their develop department had already produced a software the Advanced PDF Tools.With the help of this software,office workers will easily make pdf pages to a specific size.It’s quick and easy.So today my topic is how to make pdf pages to a specific size by using the Advanced PDF Tools.Please follow me. 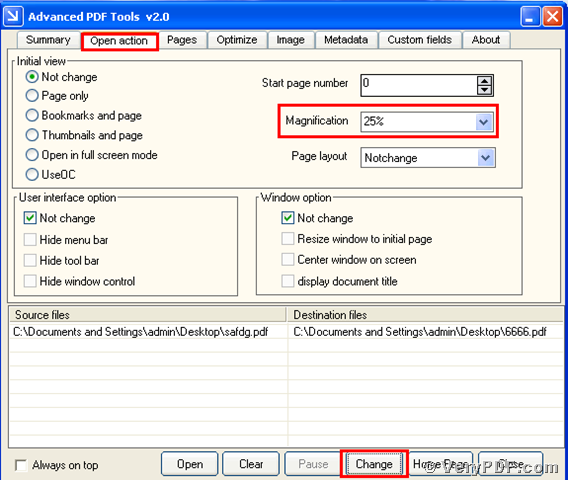 Firstly,you need to double click the icon of the Advanced PDF Tools,and let this software run .Then you need to drag your PDF file into this program.Then you will enter into the application interface.You can see the label pages like(Summary/Open actions/pages/Optimize/Image/Metadata/Custom fields/About),please click the label page”Open action” ,there is a page ,in your right hand ,behind the “Initial view”.You can see the option boxes like (start page number/Magnification/Page layout) you need to find “Magnification”and choose the “25%”.It means that you will change the magnification of your pdf pages into 25%.Then save the change.Please look at picture 1. Secondly,please open the changed pdf file, you will find the change,we had made pages to a specific size by using the Advanced PDF Tools.I also give you screenshots (picture 2 and picture 3) and compare to them, the difference is so clearly.Here please look at picture 2 and picture 3,it is very obvious. When you compare to them ,you will find that after the change,the pages become smaller than before. 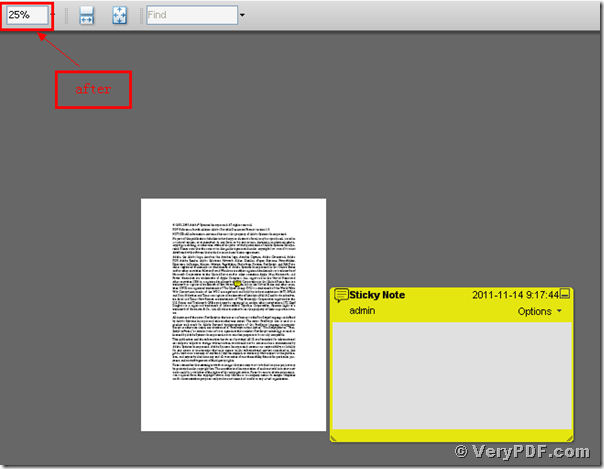 You see it is very easy to operate it,if you are interested in the Advanced PDF Tools,please visit http://www.verypdf.com/wordpress/ and read more articles.Meanwhile if you think it is useful and remember go to this website http://www.verypdf.com/order_pdftools_gui.html and purchase it,the price is very favorable. 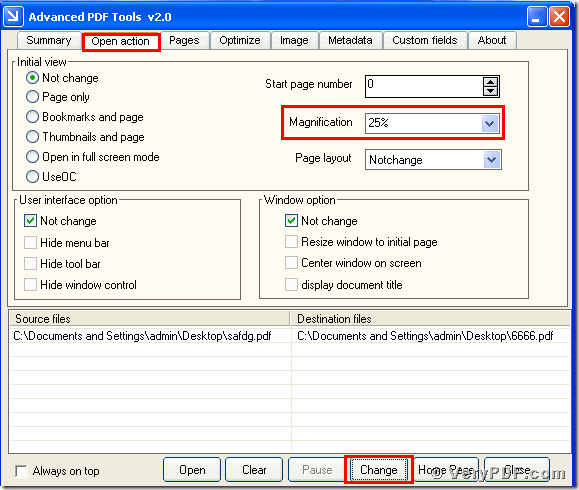 How to rotate pdf pages by using the Advanced PDF Tools? This entry was posted in Advanced PDF Tools and tagged Advanced PDF Tools, pdf file. Bookmark the permalink.